The treat of mass protests in Saudi Arabia this Friday have spooked global oil markets. The West is watching nervously. It can’t happen in Saudi Arabia can it??? What if it does?? There are two major concerns. One is clearly the threat of a disruption in Saudi oil supply. If Saudi supplies got disrupted crude would climb to hundreds of dollars a barrel and disrupt the entire global economy. The Kingdom of Saudi Arabia (KSA) promised to use its spare capacity and make up for more than a million barrels a day of disrupted Libyan oil. This is why Brent crude climbed down a notch from $115 a barrel to $113 today. But now the market is worried. If the Big One falls all bets are off. The other, bigger, underlying fear is loss of control. If Saudi Arabia were to see a real democratic revolution and become autonomous, it would upend US strategy for global dominance. The declared US strategy is literally ‘full spectrum dominance over any existing or potential challenger or group of challengers’. The lynchpin of this grand imperial strategy is control of the ‘most stupendous source of strategic power’. 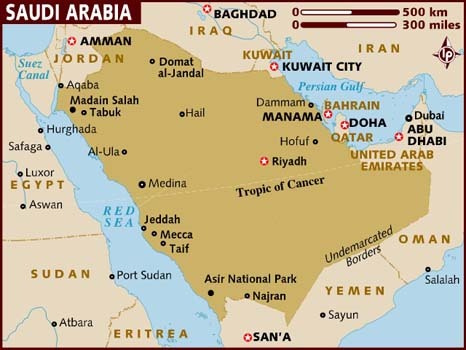 The United States enjoys a veto over any potential challenger (China) by the simple threat of cutting off access to oil from the Persian Gulf. It would cripple the economy and ground the military to a halt in days. Ensuring that Saudi Arabia is ‘stable’ is crucial to US planning. That is why the threat of democracy is most acute is the Kingdom. A Guardian article talks about the former part of this story. The latter is well understood but its not ‘nice’ to talk about it in public. One has to read between the lines. This story doesn’t even show up in the New York Times. That maybe perhaps because they don’t want to spook the markets, especially if the protests fail to materialize. It is by no means certain that there will be mass protests in the Kingdom this Friday, and regime change is only a remote possibility as of today. But we have seen how fast the situation can change in the Middle East these days. One thing is certain. If there are thousands of people on the streets of Riyadh this Friday, crude will hit $200. Brace yourself.